Have we reached a point where those who aren’t directly affected don’t realise the toll it takes on the primary producers of our country? Have we lost our compassion as a country because we are desensitised to drought as a result of constant media coverage over the last decade? Has our connection with the land deteriorated so much that we no longer recognise the indirect costs of drought? It’s time to make people aware of what drought really means, what drought does to our farmers, what drought does to our lives as every day consumers and what we can do to live better lives and support the people who make their living from supporting us. Because right now, as a country with a rich history and a lot owing to our land, it’s time we all took responsibility and did our bit to help. 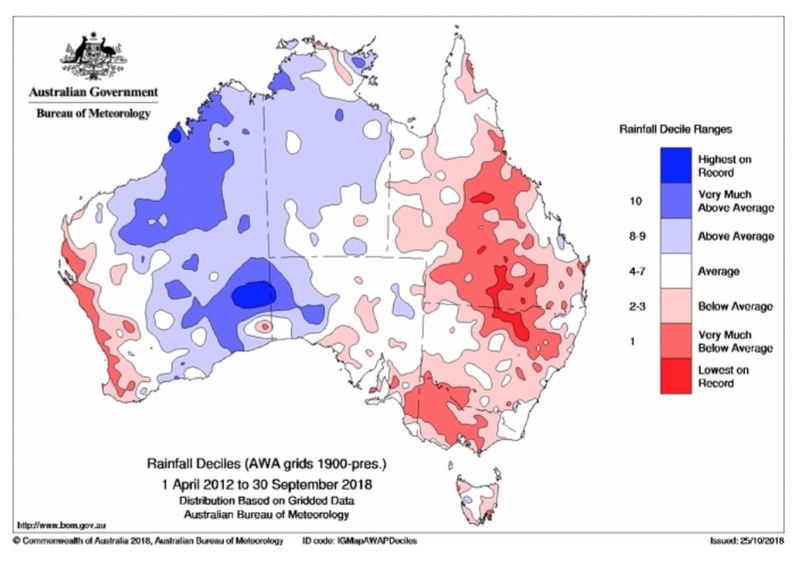 In September, the Bureau of Meteorology reported the year so far is the third driest on record for the Murray-Darling, the fourth driest on record for New South Wales and the eighth driest for Victoria since records began in 1990. For inland Queensland, dry conditions have continued since 2012 with ongoing rain deficiencies when compared to historical averages. In some cases, particularly around inland South-East Queensland and Northern New South Wales, it has been 40% below the 20-year average. While the words sound pretty bleak, the picture is almost worse. The image below shows just how much of Australia has experienced below average rainfall from 2012 to 2018. While we have just experienced a wetter than expected October, bringing great news for many, it hasn’t been enough or come at the right time as the drought has taken place against a backdrop of rising temperatures and now that we’re well into the Spring the impacts of this drought have been felt by many. For the first time in a long term, substantial efforts are being made by government to support those in this situation. Last week Prime Minister Scott Morrison announced a new fund with a kitty of $3.9 billion would be established to pay for drought resilience and water projects in the next decade. “It means we better future-proof against drought over the next 10 years and beyond” he said while speaking to Channel Nine. And while this presents us with a potential long-term solution and support system, there’s something in front of farmers that makes long-term hard to think about… Tomorrow. Farmers have been forced to hand-feed livestock, reduce feed volumes, sell-off for cheap and in some cases, shoot them dead simply to avoid bankruptcy. We aren’t just talking about selling something on Gumtree here – we’re talking about them completely removing their livelihood just to avoid getting further into the red. This is all because the cost of keeping, maintaining and growing livestock has got all too expensive. Living day to day is something that they know all too well right now. Water prices have skyrocketed with so little of it available. Prices are up 202% on last year and available supply is down considerably. The national forecast for grain is expected to be 23% less than last year, with Western Australia producing more than 50% of the yield for the first time in 20 years. The low supply is causing prices to rise to unaffordable rates. 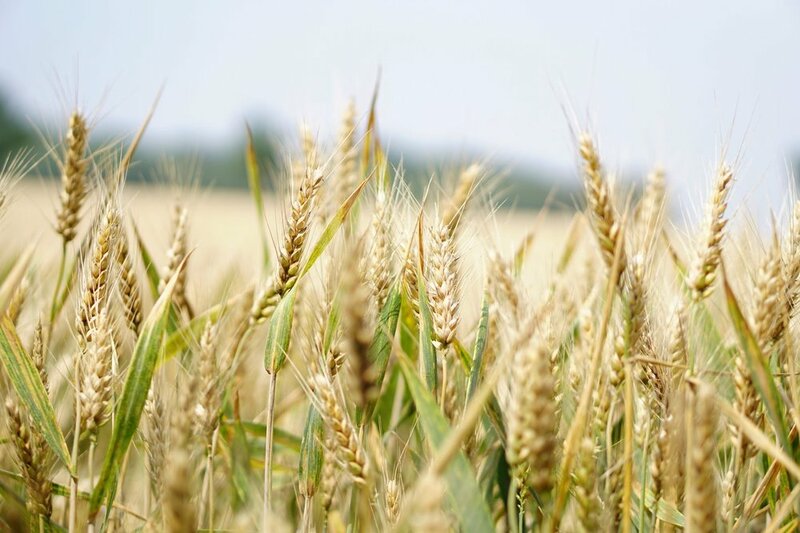 In a statement released by the Department of Agriculture, it confirmed they were assessing five applications to bulk import grain from overseas, but with biosecurity risks requiring substantial due diligence it is unlikely any decisions will be made until next year. Of most concern, the farmers are absorbing just about all of these increasing costs with supermarkets and retailers refusing to buy at sensible prices and producers so desperate for some cash in the kitty that they don’t have another option. The cost of production for Dairy Farmers has increased by 25% over the past four years, but our supermarkets are still engaging in price wars and de-valuing the product. With supermarkets buying and selling products for such a low price, industry associations are starting to voice concerns. The Commercial Egg Producers Association of WA called for an adjustment in egg prices so farmers can afford grain to feed their animals. Putting this in context, a litre of home brand equivalent milk from Woolworths at the time of writing this was $1.20 a litre and a loaf of bread just $1.50. If you’re reading this and saying, “so what?” because as long as your food prices aren’t increasing then you’ve got nothing to worry about, think again. You’re probably taking for granted the fact that you have access to Australian produced milk, Australian grown beef and Australian grown grain in your bread. Australian farmers produce almost 93% of Australia’s daily domestic food supply, and you probably didn’t even realise that. This is all at risk of being replaced with imported products – and not everywhere around the world has the values of sustainability, ethical production and animal welfare we do. This in turn creates an economic hole in Australia, as the agricultural industry is worth about $60 billion to the Australian economy. It also directly employs over 300,000 people and between the industry, it’s supply chain and affiliated food industries is responsible for 1.6 million jobs. The truth of it is that when the economy gets messy, it comes back to bite us. 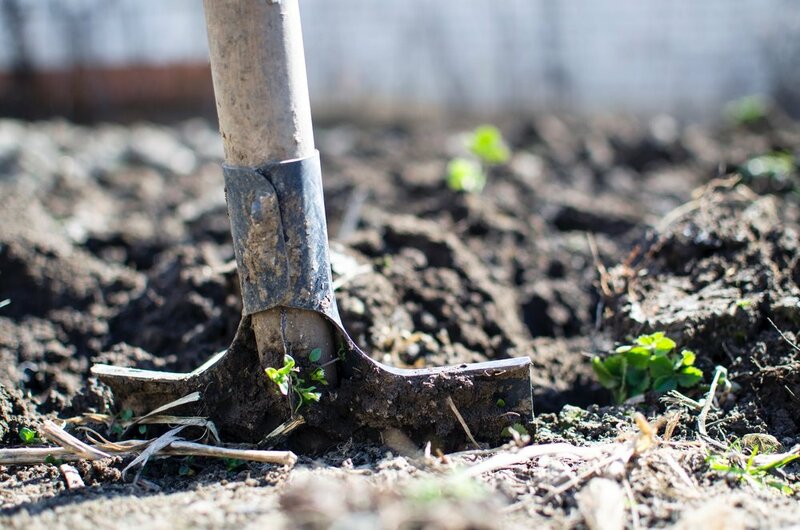 The lack of rain means soil quality is rapidly depleting as it dries out and becomes less nutrient rich. 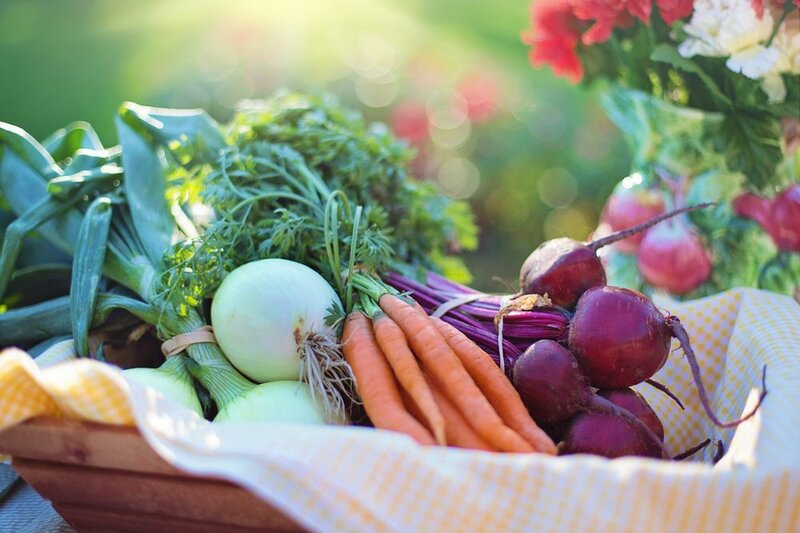 This puts us at risk of declining crop and pasture quality which affects the final products in flavour, quality and yield until soil quality can be restored. Proving that it is a problem with serious longevity. And let me remind you that all of the importing is bad for the environment, with more food miles being travelled using up our precious natural resources and emitting greenhouse gasses into the atmosphere. Is there anything we can actually do? In the same conversation where I heard someone remarked that farmers should “be used to it by now” they said the only thing people can do is to donate, and not everyone can afford to do that. Yes, there are some wonderful organisations who are helping to make the lives of Aussie farmers a little bit easier right now and we have listed them below. If you can donate, that is wonderful, I say please do. However, thinking that donating is the only thing you can do to help is just plain ignorant. People have been volunteering on farms to give a hard days’ work for nothing to keep labour costs down. Some have been driving car loads of donated goods and stopping in from place-to-place offering them to farmers. Some have been making meals and sending them out West to subsidise living costs and there is nothing stopping anybody reading this from doing any one of those things. But the single most important thing that any city folk who are lucky to be removed from the crisis can do right now, is to get educated and get out there. While speaking to a friend who is a grain farmer down in rural Victoria she reminded me that it’s not just the farmers in strife – it’s the entire communities that sustain them. Anyone who has the weekend off work with no plans, I urge you to please jump in the car with an esky in the boot and go for a drive. Find a place on the map and head out there. When you get there, fill up your car at the local servo, grab some good, local meat at fair prices and fill up your esky. Stop at the green grocer and get your fruit and vegetables there. Pull up at a bakery, grab some loaves of bread and a meat pie for lunch before getting a coffee and heading home. Talk to the people out there doing it tough. Remind them that you’re one of the many people there to support them and give them a smile. It’s amazing how a small act to make someone else’s life a little bit easier and a friendly smile can mean the world to the people in these conditions right now. Australia, it’s time to stop burying our heads in the sand and all live with the same generosity and compassion that many have already shown. It is time to support the people who make their living from supporting us.